Happy Wednesday! I hope everyone is having a wonderful and blessed week! 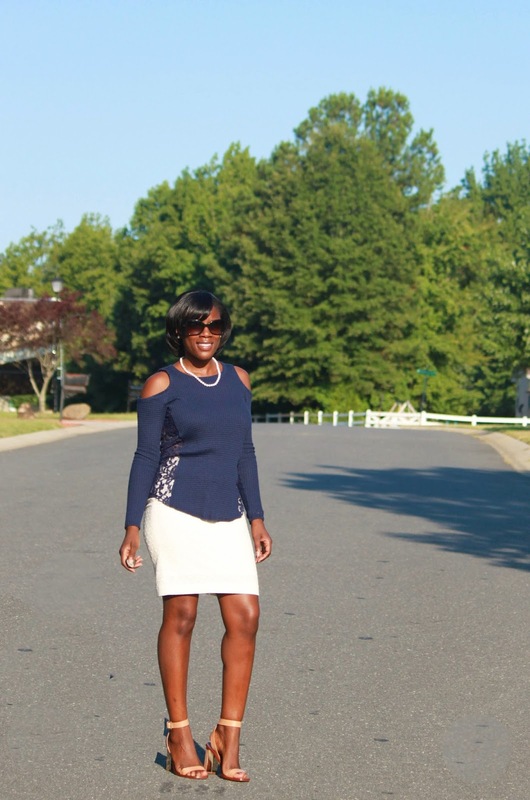 The cold shoulder trend is a great way to update my pencil skirts. Most of the time I tuck my shirts in my pencil skirts for a neat professional polished look. However, the lace detail on the side of this top is so attractive and romantic so I left it not tucked. I adore the longer light weight cold shoulder tops like this one because they transition well season to season. Most importantly it provides that additional layer of protection from the blazing sun. Basically I have a clear understanding of my personal style so when these cute trends arrive I'm not wasting money incorporating items that do not enhance my wardrobe and subtract from my financial goals. However, I have been wearing cold shoulder tops for years so I will say that this purchase enhances my wardrobe. Remember if something is trending then people are spending...and if you're spending without a clear purpose then you are pushing yourself further away from financial freedom. Thank you as always for your support! I pray you have a wonderful rest of the week! I love your top.Such a nice cut. You are right, the lace detail is relly cute, makes this top evenprettier. Loving your cold shoulder top! Look fabulous on you and it the perfect piece that you can wear in the fall too!